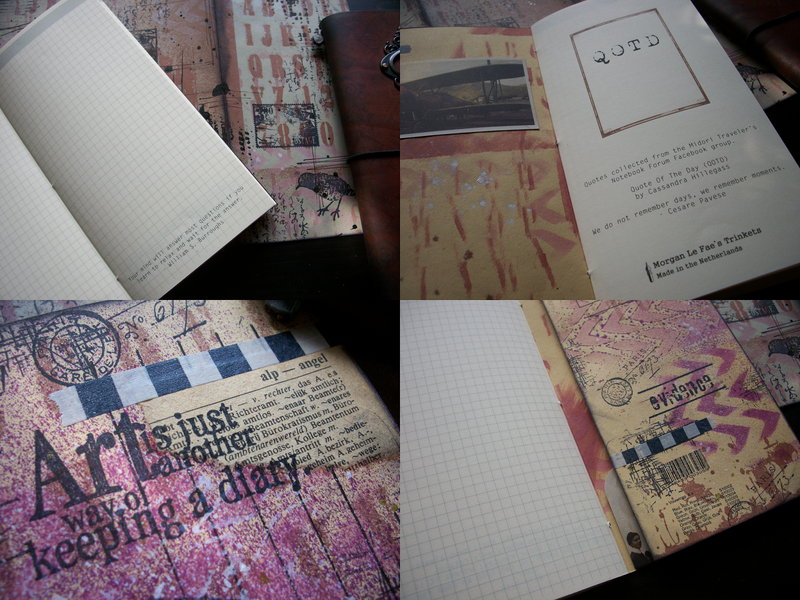 Among the inserts are some templates with quotes I collected overt the past year and used with my art journals. An insert with random quotes and an insert with Hitchhikers Guide quotes by Douglas Adams, since this is one of my all time favorite books. I've shared these free templates already on my facebook page and in several Facebook groups, but thought I'd share them here as well. I used the last one as a travel journal while on holiday and realy enjoyed the setup. In one of the Facebook groups I'm a member of, Midori Traveler's Notebook Forum, a lovely lady, named Cassandra, posts daily quotes, QOTD. I thought it was a shame to see those quotes disappear into the stream of the timeline and asked her if she was alright with me collecting those quotes to gather them into a booklet. Which she was and she graciously allowed me to share the booklet. Yesterday I printed my new journal booklet with Cassandra's quotes and made some covers to go with it. My daughter accompanied me while making a mess. We had a lot of fun together. She made the middle cover and I think it turned out beautiful.